The graphics are clunky but colourful and cheery. The premise is a wild tale of an aspiring writer, trying to make his millions and prompted to a tale of love conquering all after receiving inspiration whilst under a tree in the busy gardens of old. There are some large winnings available here but, they are stingy on the free spins and there is no bonus game. For neither love nor money, goes the old adage. 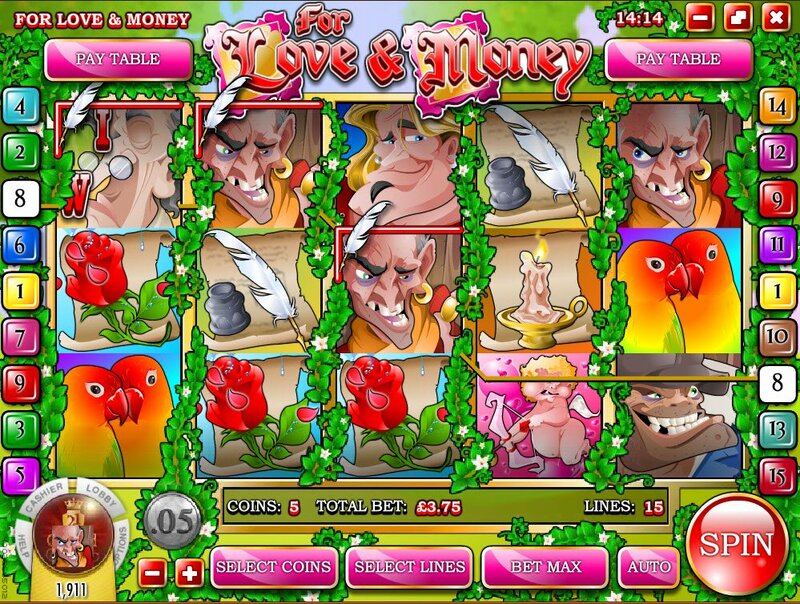 In the Love and Money Slot review, there's no chance that we won't do our bit for money, at the very least. In one of the most bizarre video slot introductions I have ever seen, Love and Money slot springs into action with the quill of a writer sat by a tree, enjoying its shade. He sees two birds nuzzling and, a lit candle pops into a thought bubble above his head. That and the costume of the people milling around, walking past him are enough to show us we have gone back in time to the 18th century. Our wispy writer is our Love and Money slot wild symbol and worth a staggering 5000 coins. 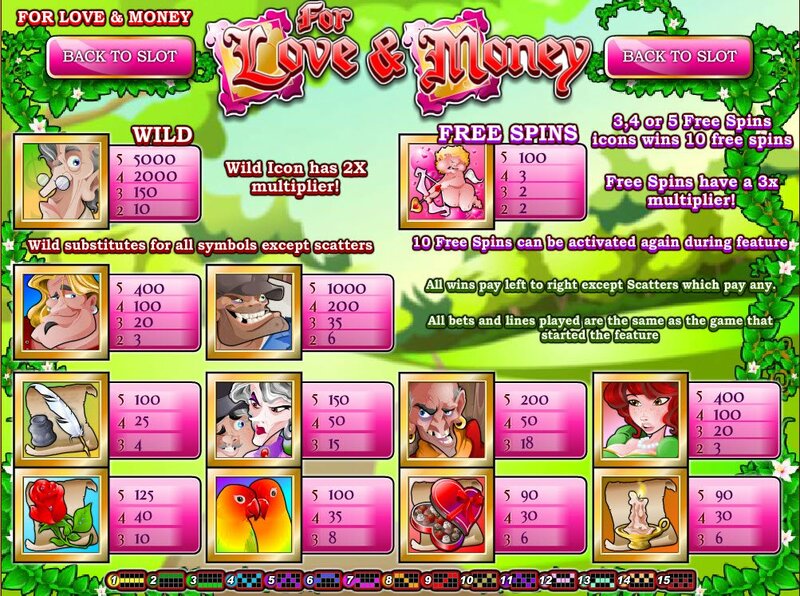 Cupid and his arrow of love will give you 10 free spins at a 3 x multiplier. We begin a story of love and champions, complete with overdone graphics, making the characters into caricatures. The hero most certainly gets the girl, as he and his gleaming smile rescue her from a man ugly enough to be a troll. Dollar signs pop into the writers head as he furiously scribbles down his plot to make money. We have all our romantic characters here, plus the rose the damsel in distress was holding on her garden variety walk. There is also the lover's epitaph; a heart shaped box of chocolates. The birds that inspired this story of love and rescue make an appearance, as does the candle "eureka" moment. All for between 90 and 400 coins! Our dare-devilling baddie is worth a whopping 1000 coins if you spin your reels to show you all 5 of his faces. Our dashing Prince Charmingesque hero will net us only 400 coins, proof that crime does pay, and baddies get the ratings and money, if not love! Our wispy writer is our Love and Money slot bonus wild symbol and worth a staggering 5,000 coins. 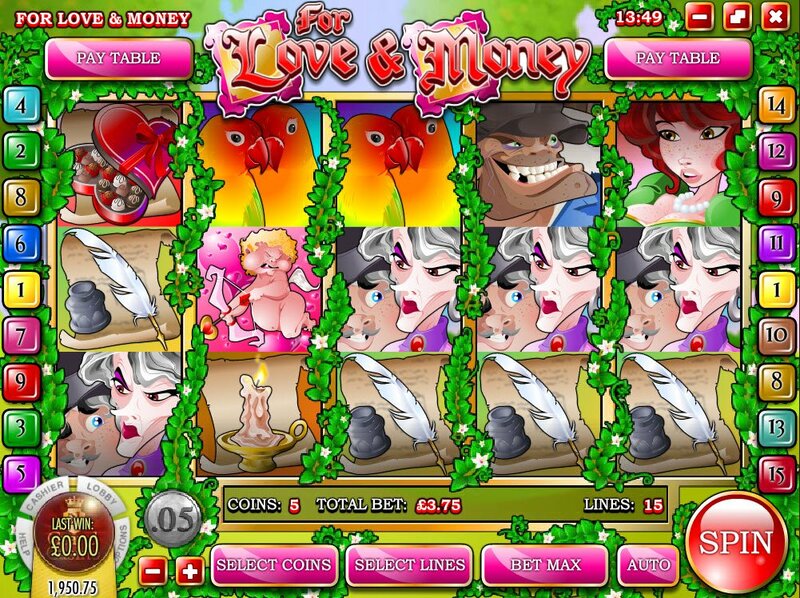 Cupid and his arrow of love will give you 10 free spins at a 3 x multiplier. Will You Find the Money in the Metal Detector Slot Review?